Small but not so beautiful; stiff opposition to small hydelprojects in Western Himalayas bring plans to a halt. Are small size projects always less harmful than large ones? The 4.5 MW Hul-1 hydroelectricity project is proposed in the Saal valley of Chamba District in Himachal Pradesh. The project is proposed to be built on the Hul stream or nallah of Saal River, a tributary of the Ravi river. On the entire stretch of Saal river, a spate of mini and micro hydroprojects have been proposed by the government of Himachal Pradesh. A similar small project on the same stream, Hul-2 was cancelled by the state government in 2007 on account of its impact on the drinking water supply to the adjoining Chamba town and irrigation for the vegetable growing areas downstream of the project. The project is being executed by Hul Hydropower Private Limited (HHPPL), an Indian company based in Hyderabad, Andhra Pradesh. The preparation of the Detailed Project Report was accorded to M/S Astha Project (India) and the Memorandum of Understanding (MoU) for the same was signed on 16th November 1996. The Implementation Agreement was signed between M/S Astha Project Private Limited (India) and GoHP in 2001 thus giving clearance to generate 2.5 MW of electricity. However in 2003, the capacity was enhanced from 2.5 MW to 4.5 MW. In the same year, on 8th July 2003, the Himachal Pradesh State Electricity Board (HPSEB) also granted a techno-economic feasibility to 4.5 MW Hul-1 project. The case of Hul project is another case in point of how transnational capital grabs investment opportunities in remote areas and builds new capital extraction frontiers. The story of Hul shows how the project, even if of small dimension, has significant implications on global capital; it shows in fact, how local firms access the transnational investment funds to secure energy plants which do not require documentation on viability and sustainability. As per an analysis done by South Asia Network on Dams, Rivers and People (SANDRP) questioning the financial situation of the project funders and conditions under which the CDM's might have been granted records, "It is also surprising that a small company has enough finance to hang around twiddling its thumbs, waiting for the project to start. The profits must be worth the wait. A look at the profile of HHPPL provides some answers. HHPPL is a joint venture of the Astha Projects (India) Ltd and Indus Power & Infrastructure, a Mauritius and USA based company. Moreover, the son of an Andhra based politician has stakes in this project. A US based hedge fund, Wexford Capital LLC (Wexford) also has stakes in the project.". In an another extensive study of the Project Detailed Document by SANDRP reveals that "PDD does not mention either the 1996 MOU nor the protests since 2003 only shows that the company is misleading the UNFCCC and global stakeholders." To raise the issue of CDM in specific, opponents of the projects have in the past jointly written a letter against the grant of carbon credits to the project. [6, at the bottom of the page]. The history of the local struggle against Hul hydroelectricity projects dates back to 2003. The local struggle against Hul is significant for several reasons. Apart from being more than a decade old struggle, the people's movement fundamentally questioned the much touted 'good governance' model of the state. The people's struggle on several fronts dismantled the myth of Himachal Pradesh being a 'peaceful' state and exposed the non-democratic and biased nature of the state's bureaucratic machinery. Like several other hydroelectric project conflicts in the state, the impacts on local water sources, forests and local economy were and still are core to this protest struggle too. A series of memorandums and resolutions have been passed against the Hull Project both by directly and indirectly affected gram sabhas to all concerned departments and government officials over these years. It was the Gram Sabha of Jadera Panchayat that first passed its resolution against the project. The project affected population from 5 panchayats have united under the banner of Sal Ghaati Bachao Sangarsh Morcha. • In 2010, there were instances of violence reported. Local public protesting peacefully were blatantly attacked and some grievously injured by the goons/ contractors of the project company. • According to SGBSM, "Hul- 1 is going to destroy the livestock economy of Sillagraht and Jadera Panchyats, while Hul-2 will deprive hundreds of vegetable and fruit growers from irrigation facility and the negative cumulative adverse impact of these projects will be on watermill economy, fishing, irrigation and drinking water schemes and overall adverse impact on local ecology. These two power projects are going to lead to private appropriation of community resources that are a support base for the subsistence livelihood and cash economy of the entire valley"  • As per SGBSM estimates, the Hul stream sustains around 6000 people residing in Saal valley. Jadera and Silagraht-the two main affected panchayats fulfil approximately 50 percent dairy needs of Chamba town. Most families of the 5 panchayats are dependent on commercial sale of milk and ghee for their livelihood. • In June 2006, the signing of the Implementation Agreement for Hul-2 evoked fresh protests again. Again, it witnessed a unanimous resolution against the project by Jadera Panchayat. The District Council (Zila Parishad) Chamba at this stage asked the State Government for cancellation of Hul-2 micro hydroelectric power project looking at the interests of local population. 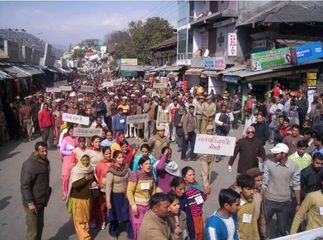 • January 2007 also witnessed a huge protest rally in Chamba town by SGBSM with participation of people from 8 Panchayats. The other environmental justice organisations that extended solidarity to the movement were Himalaya Bachao Samiti and Himalaya Niti Abhiyan. The groups with SGBSM demanded an altogether scrapping of the project. • Due to growing pressure by local residents, in May 2007, a District-level review committee was set up. On 6th June, the review committee held a public hearing at Jadera. Interestingly, the report of the review committee in many ways upholded the local livelihood interests, however, on ground they were being subjected to grave violations. • The non implementation and violation of provisions of Forest Rights Act also became a major issue at this point. Gram Sabhas again put forward the demand to not initiate any project construction activities on forest land till people's right were recognized under FRA. Memorandums were sent out routinely to authorities to stop illegal activities and to protect 386 bighas of irrigated land that would be converted into barren land for project construction and related activities. • 2010, the events started taking a violent turn. In February 2010, company’s contractors and goons attacked members of SGBSM in village Chungah with swords, guns and sticks on peacefully protesting locals, out of which five members suffered life threatening injuries. As a response, members of Sangharsh Morcha organized a huge protest in Chamba town and demanded immediate arrest of all the criminals involved in the Jadera incident and to cancel Hul hydroelectricity projects. As a response to the public outcry, the State Government again set up a committee under chairmanship of Additional District Magistrate (ADM) Chamba. The committee's findings established that Hul-2 HEP be scrapped citing law and order problem in the area. However, a setback to the local struggle was now a High Court judgement which held that the police render all necessary and effective protection to the company for carrying out the work as and when requested by them, at the expense of the company and let the protestors register their protest peacefully. • In April 2011, the company also sought police protection to initiate the project work against which the locals sat on peaceful dharna for indefinite period. However in July 2011, the company was forced to withdraw police force and failed to initiate project construction activity due to stiff resistance from local community. On 12th August 2011, SGBSM conducted a rally in Chamba town and called off its dharna for time being and put onus on the state government in case of any eventuality taking the project the state government will be responsible. After that SBGSM challenged the High court decision in the Supreme Court, which has put on hold the high court order and asked the petitioners to file a fresh case in National Green tribunal. Project Details The diversion structure (a 5km long pipeline) of the project is to be constructed in the Sillaghart panchayat which will divert water from three streams. The power house is proposed to come up in Kalehun village of Jadera panchayat. The water will be taken out of the stream at a height of 1642 metres and re- released at 1313 metres. The total length of Saal river flowing through Chamba is 25 kms, and the Hul 1 (4.5 MW) hydroelectric project would disturb approximately 5 kms, or one fourth of its flow. Other According to survey conducted by Sal Ghati Bachao Sangarsh Morcha, Chamba, there are 1782 trees of different species and 2045 bushes of local variety are falling in the path of proposed five km open water channel for Hul-1. Other Close to 25 gharats are functional with the water of Hul nallah which would be forced to shut down, thus effecting the main source of livelihoods of 25 families that depend upon them. Development of Alternatives Not to build the hydelprojects as they would heavily affect local economy. This whole region is known for milk, ghee and honey production which depends on the local bushes and fodder available in the forest. This is a type of economy people wants to protect and continue. Why? Explain briefly. Though the Hul-2 project had been cancelled in year 2007 by the committee constituted under the chairmanship of ADM Chamba, the fight is ongoing for Hul 1. The case has also revealed the bias of the State Government which has gone all out to protect the project proponents by offering them police protection, but has chosen to overlook the fundamental Right to Life of those protesting to protect their land and water.